For the last installment of the February lookbook, we’ve styled a few looks that focus on the utilizing color in your wardrobe without overdoing it. The key with these looks is that while incorporating a bright and popping color such as red, the color serves an even stronger purpose by pairing it with more subdued/neutral colors. For example, in our first look, the model is wearing a red top from Hudson, paired with a white Jordan 23 undershirt for an added layer of separation between the shirt and dark colored Brooklyn Cloth pants. As added details to the outfit, a Nike snapback cap and blue Nike Huaraches allow the red shirt to really pop. With our next look, our model is sporting Brooklyn Cloth marsala sweats. Although it’s a darker shade of red, wearing a sweats this color can send the right message when paired with the right pieces. The New Era Spurs beanie, Adidas hoodie and crispy white adidas high tops pair well with the sweats that serve as a statement. The next photo shows the model rocking a Hudson plaid top, with black Nike “Rule the empire” long sleeve and Fairplay grey joggers. Another example of allowing a “louder” garment to turn heads while the rest of the outfit is more minimal and quiet with a purpose. And last but not least, this look is the most casual of the styled outfits. 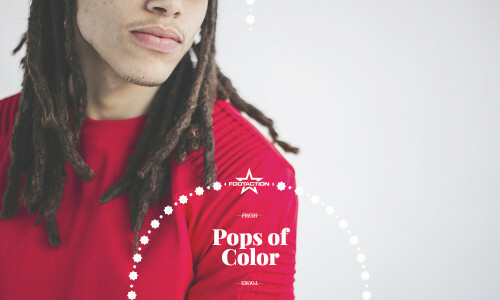 While the dominant color of red is his shirt color, the pop of color is seen on the long-sleeve undershirt in addition to being seen on the brim of the baseball cap. The look is capped off with neutral black pants and clean white sneakers. 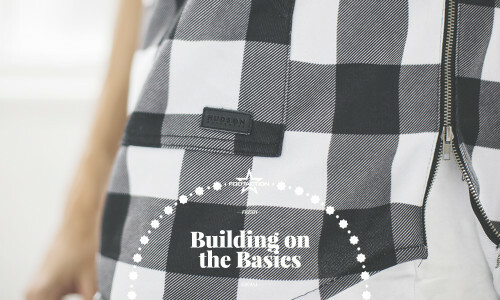 For this second installment of the February lookbook, we’re focusing on expanding your style vocabulary by “building on the basics.” Most of the time purely functional, utilitarian and simple pieces are great as the foundation to an outfit, but mixing/matching pieces with different materials, textures and patterns is the way to go. 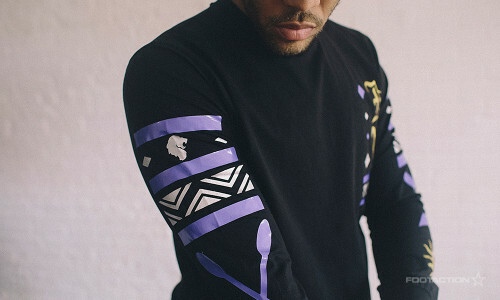 We’ve put together a few looks for you to gather some ideas for outfits for the month. While we’re halfway through February, months have gone by where we’ve been wearing jackets, parkas and hoodies on a regular basis along with coordinating pieces to keep us warm. 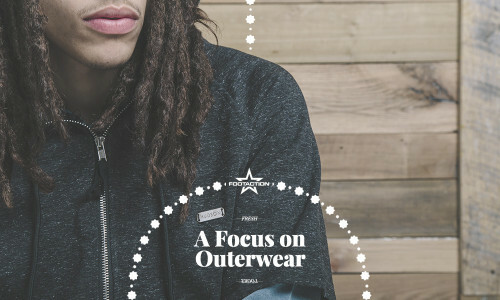 Keeping your outfits fresh and not repetitive is a task, so we’ve put together some looks for you to show how you can mix it up with various types of outerwear and how they coordinate with the other pieces you wear. For the first look, our model is wearing a grey Hudson short-sleeve hoodie with a long-sleeve shirt layered underneath it. The hoodie is the darkest part of the outfit, while the rest of the look is lighter even down to the crisp white kicks. For more casual days, this look is great if you’re looking to be fresh yet still comfortable. The next look is anchored by a Carolina Blue Nike zip-up hoodie, which is paired with clean and classic beige pants and light-colored Nikes to cap it off. The pants and kicks serve as a staple for one’s wardrobe while the hoodie brings that pop of color while keeping things casual and light. The last look is the most sophisticated of three, which features a variety of textures and patterns for the two-tone windbreaker, grey jogger pants, highly-patterned Nike boots and grey ball cap. Although there is a lot going on with this look from a detail perspective, the look comes together by its common color: grey. Each part of the outfit returns to that theme which allows anyone to recognize there was thought and individual style put into this outfit. Owning your style is about staying calm, cool and comfortable. The New Year is in full swing, and it’s time to refresh that closet! Whether it’s matching your tried-and-true staple pieces with crispy new layers from Hudson or Rocksmith, rebooting your kicks game for the seasons ahead with new Jordan‘s or Nike‘s or rotating in some clean New Era caps, it’s all about confidence. February’s lookbook displays the essence of new beginnings, with more offerings from Two Angle and Waimea. It’s your time. Own it.